Despite Kibale National Park’s protected status, people still enter the forest illegally to poach animals and extract resources (e.g. logging, collecting firewood, burning wood for charcoal, gathering medicinal plants, grazing livestock). In Kibale, most poaching occurs on a small scale, with local hunters killing animals to supply meat for their families. Farmers may also kill animals to prevent them from raiding crops planted near the park boundaries. Poachers predominately focus their efforts on small game, using illusive hunting practices, such as snaring or net hunting. These types of human disturbance all threaten the livelihood and longevity of the park and its inhabitants. 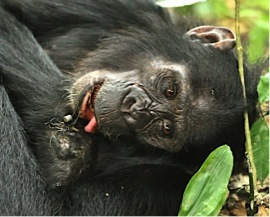 However, one of the most direct threats to chimpanzees in Kibale comes from snaring. 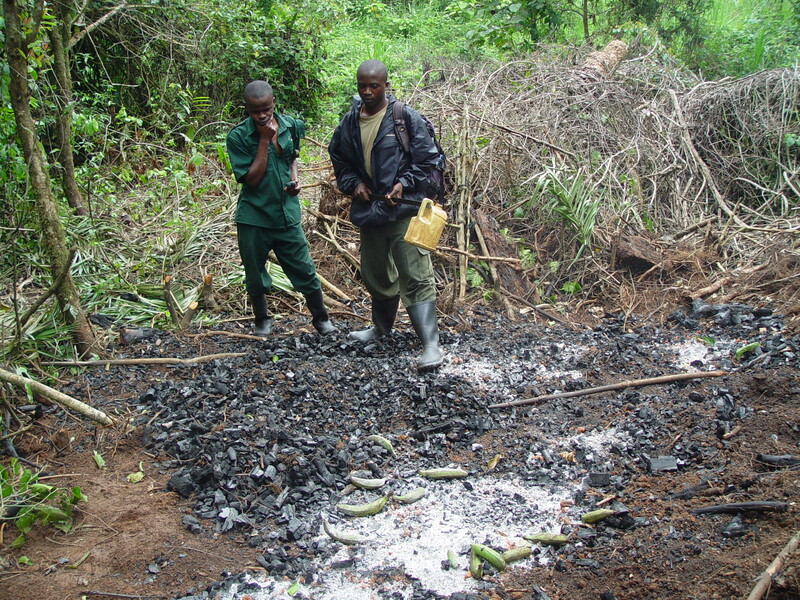 The first evidence of primates being roasted for bushmeat in Kibale National Park was documented in 2013. The blackened head, hand, and tail of a red colobus monkey were found at a poachers’ camp. 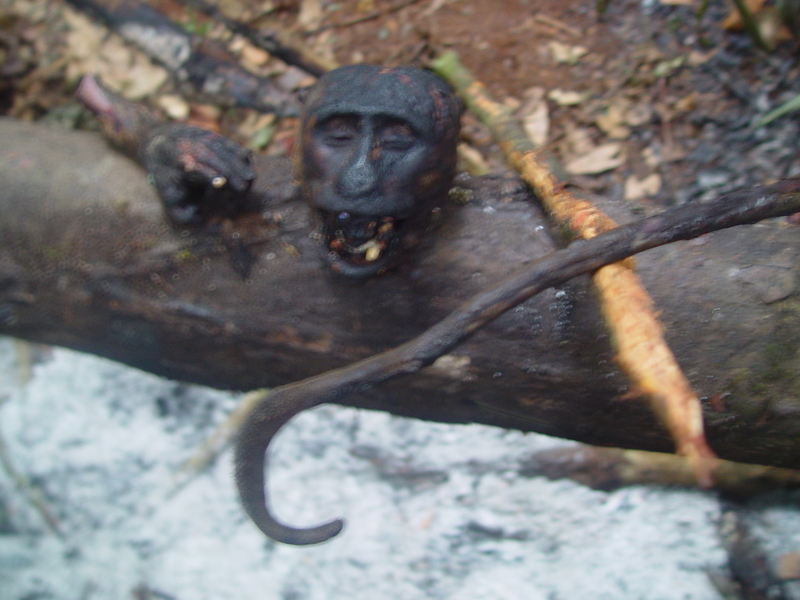 When poachers roast bushmeat, they remove the bark from a large stick and sharpen the end (as seen in the photo), skewering the meat, and suspending it over the fire for cooking. Eating primates is taboo among the Ugandan tribes living around Kibale National Park. In this case, our field staff suspect that poachers purposely left behind the recognizable body parts in order to deceptively combine the monkey meat with culturally acceptable bushmeat, like duiker and bushpig. (Photo: KSRP). Hunting with Snares. Although Ugandans do not traditionally target primates for consumption, chimpanzees can accidentally get caught in poachers’ snares that are intended for other game, such as bushpigs and duikers (see bushmeat trade). Snares are inexpensive and simple to set. 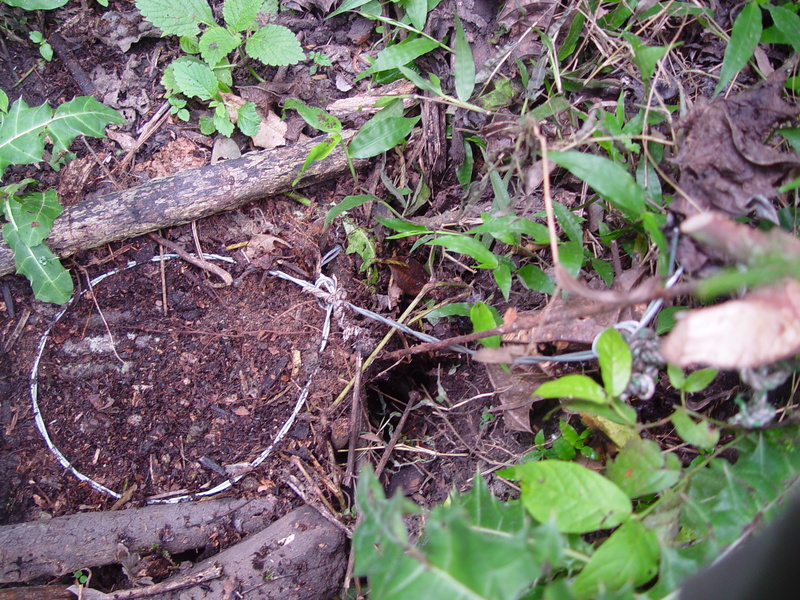 A typical snare consists of a camouflaged loop of wire or nylon rope attached to a bent pole. When an animal steps into the snare, the pole releases and tightens the wire or nylon loop around its leg. The animal then becomes tethered to the pole until the poacher returns to retrieve it, which can be hours, days, or even weeks later. Snares can readily cut flesh to the bone, leaving many animals to die in agony before the poacher returns. To better understand how a snare works, click here to watch our senior snare removal ranger give a video demonstration. 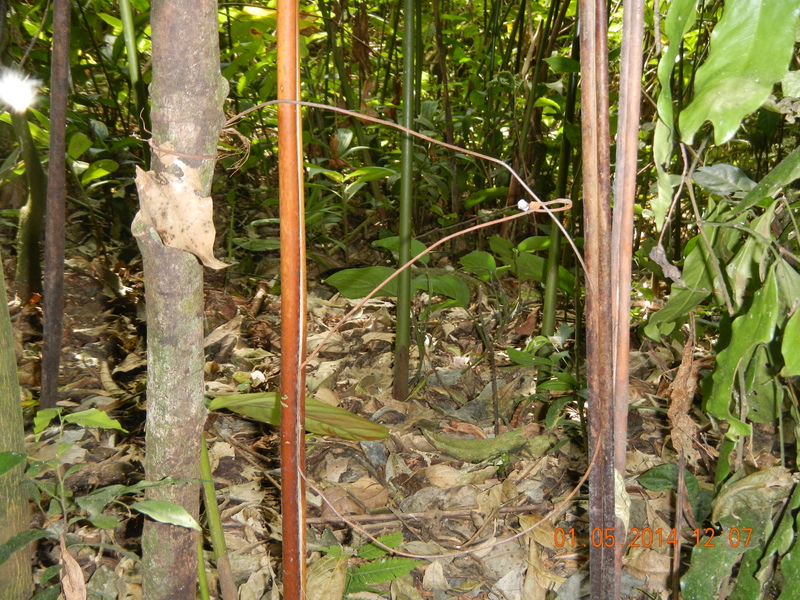 Snares as Landmines in the Forest. Snares represent a major hazard for chimpanzees, who step in them when traveling on the forest floor. Juveniles are particularly vulnerable, because they play as they travel, and consequently pay less attention to where they are stepping. Unlike many of the intended target animals, chimpanzees are incredibly strong, and thus typically able to rip the wire from the pole or the pole from the ground. However, this causes the snare loop to tighten and cut deeper into a chimpanzee’s skin, making it nearly impossible to release the wire using fingers or teeth. 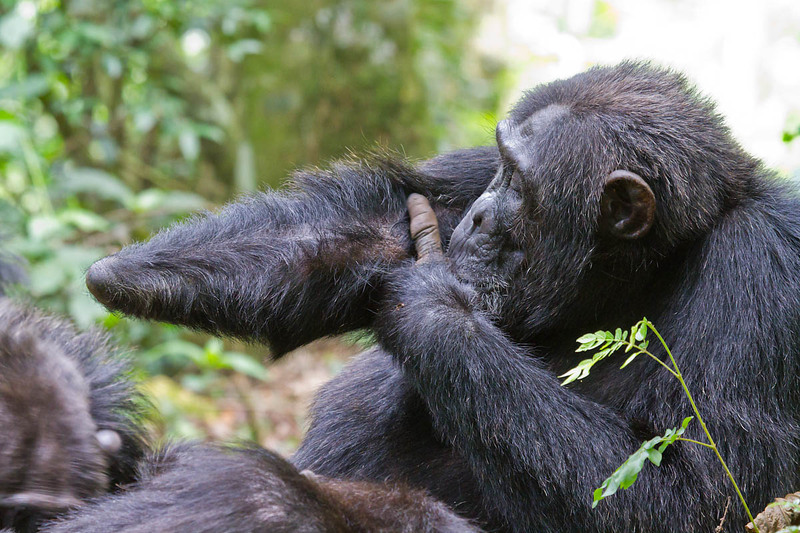 Without human intervention, many chimpanzees will become permanently maimed by a snare. If a chimpanzee’s life is in danger from a snare, the Kibale Chimpanzee Project sometimes intervenes, in collaboration with the Uganda Wildlife Authority, to provide medical care. Chimpanzee Snare Injuries. Approximately one-third of chimpanzees at Kanyawara have snare injuries, ranging from missing, bent, or paralyzed digits, to deformed or missing hands and feet. For animals that rely on climbing and traveling long distances to find food, these injuries can be a severe impediment to survival, and can affect their social behavior and status. The luckless Max, for example, lost both of his feet during separate snare incidents at the ages of 5 and 8. Now as an adult male, Max still spends most of his time in close proximity to his mother. He is often picked on by other males, and has virtually no chance of becoming high-ranking. Had Max never been snared, his social standing in the Kanyawara community might have been very different. Nectar, another unfortunate juvenile, lost one of her hands to a snare at a young age, and later had her remaining fingers bound together by a second snare. KCP staff tried unsuccessfully to intervene, and she disappeared soon after. 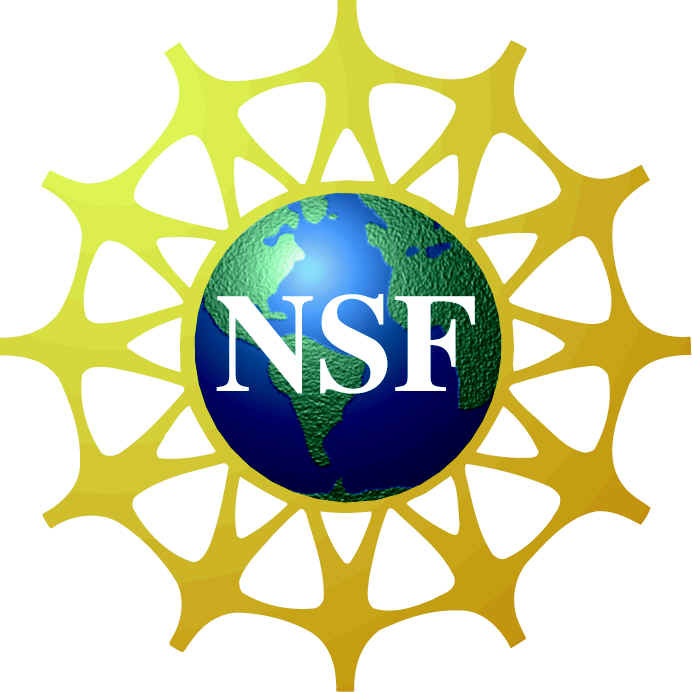 To receive regular updates about our coservation activities, subscribe to our newsletter.